How It’s New York: Clannad performed at New York’s Concert Hall at the Society for Ethical Culture. How It’s Irish: Clannad is an Irish band from Gweedore, County Donegal. The band’s music is a blend of traditional Irish, folk rock, and New Age. John Kearns reviews Clannad in concert in New York last week, on their first American tour in 19 years, reports back on what the artists said during a tour of the band’s catalogue and songs that reached back hundreds of years! Read our earlier interview with Moya here, and listen to her on a podcast we did last spring here! Stay tuned for another podcast with Moya! On October 2, 2012, legendary Irish band Clannad performed in New York City for the first time in 17 years, playing a varied selection of tunes old and new, traditional and original, contemplative and rowdy. Many in the audience seem to have been waiting expectantly since the group’s last performance and recognized their favorite songs in a single synthesizer chord. Formed in 1970, Clannad is a family band composed of siblings and twin uncles. Moya Brennan plays the harp and is on lead vocals. Ciarán Brennan, who contributed a few original songs to the evening, is on bass, keyboard, and vocals. Pól Brennan is a virtual one-man band on guitar, flute, tin whistle, keyboards, and vocals. The Brennan’s uncles, Noel and Pádraig Duggan,are on mandolin and vocals and guitar, respectively. Jed Lynch backed up the band with his drum kit and congas and Ian Parker played keyboard. The family members seemed to be happy to be playing in New York again, putting their voices together for their trademark ethereal harmonies, dancing easily and freely, and< having a couple of laughs before an audience that included old friends and relatives. I met a first cousin of the Brennans who had traveled from Gweedore. Moya mentioned that her brother was in the lobby selling Clannad t-shirts. Clannad played two sets at the beautiful, churchlike Concert Hall with its impressive wordwork, pews, and marvellous acoustics. The first set focused on older, traditional Irish songs, almost all in the Irish language. After the show, Pól said that the band did a lot of research, digging through its albums from the 70s to choose the first set’s songs. The second set, also sung mostly in Irish, incorporated some of Clannad’s more pop tunes, featuring music from the soundtracks of television series and movies such as Harry’s Game and The Last of the Mohicans. Moya’s harp at the forefront and the traditional Donegal and Connacht tunes connected the evening’s performance to some of the oldest Irish musical traditions. The keyboards (at times three played simultaneously), drums, and electric bass added modern notes to the music, though when mixed with the group’s haunting vocal harmonies still managed to sound ancient. Clannad reached back to the 18th century for its next two songs, by blind harper, Turlough O’Carolan. According to Moya, O’Carolan liked to sing about two things, “whiskey and women.” The two selected tunes, “Eleanor Plunkett” and “Fairly Shut of Her” were about the latter. It was treat to hear these centuries-old songs on Moya Brennan’s harp, accompanied by the band. Jed Lynch gave the original song, “Tower Hill,” a little spice by switching to the conga drums. 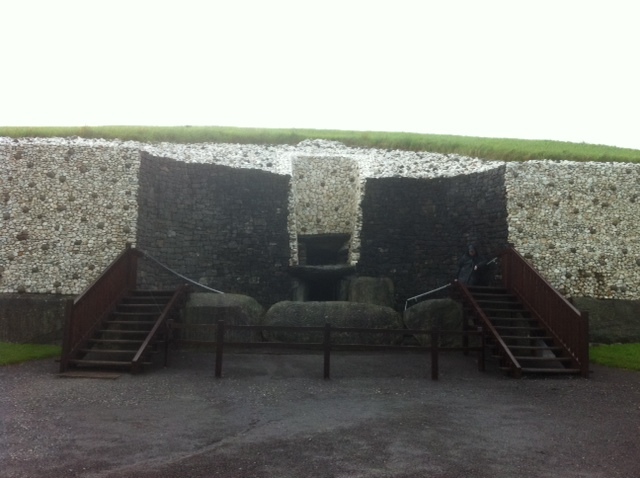 Clannad slowed things down with “Newgrange,” an original song about the 5000-year-old passage tomb in the Boyne valley, then picked up the pace again with “dTigeas a Damhsa,” a song about dancing that the Brennans sang as children. The enthusiastic audience got Clannad to came back out for an encore, for which the group sang a lovely version of Yeat’s “Down by the Sally Gardens,” urging everyone to sing along with the second pass through the song’s two verses. After that, folks in the Concert Hall seemed satisfied. We had been taken on a tour through a legendary band’s catalogue, were happy to see them again, and to hear their promise not stay away so long this time. Clannad will be playing gigs in the tri-state area over the next few days. So you still have a chance to catch one of their shows. Visit clannad.ie for more information.